It’s said that you get back many times what generosity you give out. And for a Tuam woman that has proven to be truer than she could ever have thought. 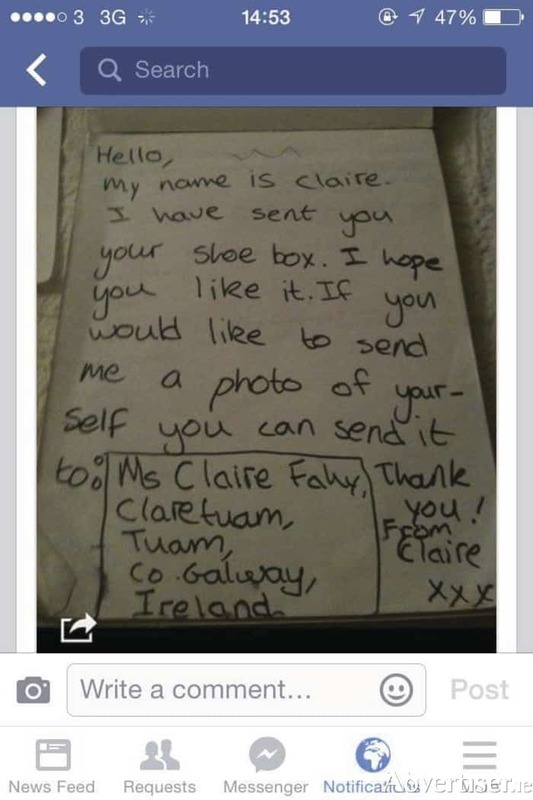 16 years ago Claire Fahy, then just 8 years old, along with her friends boxed up toys and clothes and sent them to Armenia. Though she included a note she did not expect to ever hear from any of the people who would receive the gifts. But one recipient never forgot this act of kindness. It took him 16 years but finally Arsen Khachatryan from Yerevan in Armenia was able to make contact with Claire. Arlen said he always wanted to express his gratitude to ‘a very generous woman’ for her kind act. And finally, through the use of Facebook, he was able to. I’m crying for 24 hours now. Claire has continued her correspondence with Arsen via Facebook since he made contact with her. Arsen is now 27 years old, an accountant with his own travel agency, a wife and a young baby.